Reading the creator's description of the title sequence to Made in YU helps Art of the Title understand just how savvy the design is beyond the superlative animation. Some favorite moments, incidentally, include the organic reveal of Sasha Drakulić's credit and the contemplative car window reflections. A discussion with ARMIN OSMANCEVIC and NIKLAS RISSLER of the Swedish studio WERK. Detail the origins of this project for us. WERK: The aim was to tell a story about what happened before the events in the film, which revolve around a former Yugoslavian family that came to Sweden in 1960's. 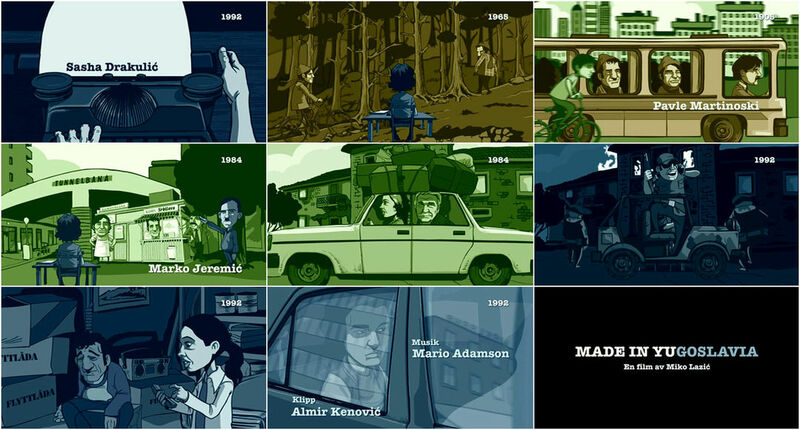 The film follows their lives through the 1980's and 1990's. We first made the character designs, storyboards and animatic and presented it to director Miko Lazic and he gave us a free hand, which is something of a dream for a designer. We then came up with the concept of moving through time using three color schemes and also a year-counter in the upper right corner [as] the movie itself jumps back and forth in time. The sequence illustrates character history and introduces the story that follows. What was your inspiration for such an original piece? The original inspiration was Princess Mononoke by Hayao Miyazaki and Sayonara, a short film made by Niklas Rissler after his visit to Japan. Were any of the designers affected by the war? Actually, title sequence director Armin Osmancevic experienced the war in Bosnia 1992-1993 before he managed to escape from the war together with his family. He now lives and works in Stockholm, Sweden. How long did this sequence take to design? Our initial schedule was 6 weeks for 120 seconds (the original film ends in an animated sequence as well). Due to planning constraints we ended up working 17-hour days for 19 days. Armin was doing directing, storyboard and backdrops, while Niklas drew characters and edited the sequence. What kind of response to the title sequence have you received to-date? First of all, it received nice reviews in Swedish newspapers and boosted the film itself. Secondly, it screened in several Flash festivals because it was made on a few laptops using Flash, then exported to After Effects for editing. The sequence worked very well in movie theaters without any loss in resolution. What the team did not do, was to submit to other diverse competitions and that is something that we still regret. Who are some of your favorite designers? There are many designers we like and respect, but we would like to mention some of our all time influences: Hayao Miyazaki for the innocence in his works, Jean 'Moebius' Giraud for the eternal inspiration, Paul Arden for his witty quotes and Darren Aronofsky for his brave vision of doing something new every time. Is there someone relatively new whose work excites you? We recently saw some GKaster works, that we really enjoyed. Otherwise, we like Serialcut, Psyop and Alex Trochut. How does WERK plan to build off the success of its Made in YU sequence? After we completed that sequence, we were asked to produce a music promo for The Sounds, to be aired on MTV USA. Unfortunately, I had already started at a web agency working globally for adidas, BMW and UNICEF, and Niklas had to finish his studies, so we not able to commit to The Sounds project. Now, a few years later we kick off our own production company and hope to get involved with the agencies in order to make some new and interesting projects. Do you want to give us a taste of any upcoming projects you have? Well, usually it is always confidential from the client's side. There are two projects that we are working on now, a music video and another film for the SEB bank. Except that, we are in post-production of our very first short feature, entitled Washing. The film itself will be completely done by the WERK team from script and storyboard to film titles and advertising. It is financed by us as well which gives us total freedom. We have dead people, some religious inserts and nice music. But it's not at all what you think! We love to do different things every time.